Pressure Gauges | Pressure Switches | Pressure Instrumentation - Chase Controls, Inc.
Chase Controls is a stocking distributor for several manufacturers of pressure instrumentation products. 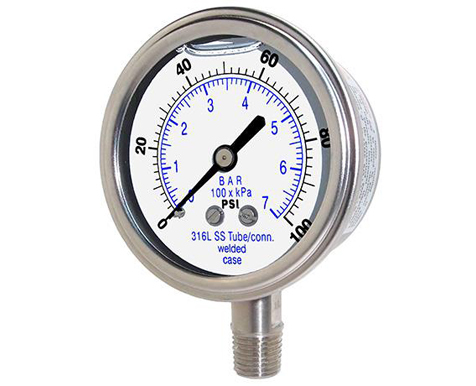 Reotemp and Blue Ribbon Corp. manufacture a complete line of pressure gauges ranging in dial sizes from 1 ½” to 4 ½”. Both manufacturers offer case materials in black steel, stainless steel, and phenolic. The internals are typically brass or 316SS. All pressure gauges are offered in either dry or liquid filled cases. Sync-Lok instrument tube fittings provide a leak-proof seal which will withstand high pressure, impulse, vibration and temperature. These features offer the highest safety and maintenance-free operation. Each component of Sync-Lok’s tube fittings is precision machined to the highest tolerances, while maintaining TQM practices throughout the manufacturing process. LaMot and Continental Disc manufacture rupture discs and rupture disc holders. LaMot offers standard and composite style rupture discs. Sizes range from ¼” to 12” in diameter. Since 1964, the LaMot brand of rupture discs and holders have been manufactured using proven techniques, industry standards, and modern manufacturing methods. Continental Disc Corporation has been manufacturing rupture discs and rupture disc holders since 1964 as well. They offer tension type, reverse bucking type and other specialized rupture discs. Continental offers discs up to 24” in diameter. The K-Dyne Model P40 Pneumatic and Hydraulic Pressure Switch was specifically designed for the rigorous oilfield environment. It functions as 3-way block and bleed valve that can be configured to respond to increasing or decreasing process pressures. The standard pressure switch utilizes a patented system which incorporates three piston diameters that are selected by simply changing the orientation of one piston. The Model P40 offers sensing ranges from 10 PSI to 10,000 PSI.